Earthly Delights by Kerry Greenwood, a Mysterious Review. 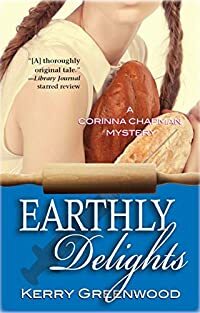 Review: Kerry Greenwood, author of the popular Phryne Fisher mysteries, introduces a new series featuring Melbourne (Australia) bakery owner Corinna Chapman in Earthly Delights. It is probably inevitable and no doubt unfair to compare this new series introducing Corinna Chapman to Greenwood's long-running series featuring Phryne Fisher. But Greenwood seems to invite such comparison. The plot isn't important in Earthly Delights, which is for the most part completely forgettable; the author's focus here is on character development. She seems determined to portray Corinna Chapman as the anti-Phryne Fisher. Where Phyrne came from a humble background to become a member of the Melbourne aristocracy, Corinna has abandoned the world of high finance (and no doubt high income) to toil in a bakery. Phryne is sophisticated and stylish; Corinna is dowdy. Phryne is a woman of action; Corinna seems content to allow events to come to her. They do have something in common: they're both terribly opinionated. But while this trait works in Phyrne's favor, it makes Corinna seem a bit petulant. It's all well and good to create a new character for a series different from the one readers are familiar with. But Greenwood has extended this comparison between the two to the plots of their respective series. The Phyrne Fisher mysteries are thrilling adventures whereas Earthly Delights is slow and cumbersome and dull. There are, for example, entire chapters that seem to be dedicated to describing the difficulties in managing a one-woman bakery and the art of making bread. Corinna Chapman has the potential to be an interesting character, but she needs something to challenge her, a puzzle to solve. Maybe the next book in the series will provide a mystery worthy of her, and the reader's, attention. Acknowledgment: Poisoned Pen Press provided an ARC of Earthly Delights for this review.